PLEASE buy this book for your pastor--but don't read it yourself! I've known for many years that being a pastor is a tough job. For most of my life, I've known that only from the outside, watching many of my pastors succumb to various forms of death. It's obvious that Satan knows the "smite the shepherd and the sheep of the flock shall be scattered" principle very well. You have probably seen the frightening statistics about the number of pastors who bite the dust. If you've been a Christian very long, you probably have seen it first hand in your own church. Only 1 pastor in 10 will actually retire as some form of minister. But since I became a lay elder in my church a year and a half ago, I've gotten to know the temptations and pressures of pastoring from the inside. Granted, the pressures I've experienced are very low compared to what vocational pastors face, or even what a lay elder at a larger church might encounter. Still, this position has exposed areas of sin in my own heart that other life challenges didn't. That's why I have been profoundly touched by Paul Tripp's latest book, Dangerous Calling. Not only does he expose, with scalpel-like precision, the very sins I have been wrestling, and not only does he explain in horrifying detail where those sins will lead if unaddressed, but he also gives great hope and encouragement by pointing back to the cross where my sins were conquered by Jesus. Paul Tripp was a pastor for a number of years and fought the sins and pressures his book describes. Then he taught in a conservative Christian seminary, and became alarmed at the way young men were being sent out into the ministry unprepared for the heart-battles they would be facing. He now believes his mission is to be "a pastor to pastors". This book is both stringent and kind, both passionate and compassionate. He writes personally, talking directly to his reader ("you", not "they") and sharing many sins from his own life. You can tell it's the product of tears. The urgency in his tone, the realization that in his eyes this is life or death stuff he's writing about, keeps you turning the pages. It's kind of like a long letter from your dad. Dangerous Calling from Crossway on Vimeo. But as strange as it sounds, I would recommend that you not read this book yourself. You want to be able to tell your pastor when you give him the book, "I haven't read it, but I heard it is really good." If he knows you read it first, it will ruin the whole book for him. He'll wonder whether you gave it to him because you saw in him the sins the book describes and he'll see your face staring at him from every page. Also, it would be easy for a non-pastor to become more jaded towards his pastor after reading this book. One reader described this book as "bathing in razor blades". Congregation members who emotionally abuse pastors could use this book to tear their pastor apart even worse. Trust me, the Holy Spirit does not need your help to rub the message of this book in. If your pastor can read this book and remain unmoved, you probably should look for a different church. Buy the book, give it to your pastor, and ask God to bless him with repentance and you with compassion. Last year we met the Georges at a 5 day training in Bible storying by Simply the Story. Sometimes we tend to romanticize missions life. I hope you'll take time to read their latest two blog posts (links below). They are short and have pictures. Kind of puts a different perspective on things doesn't it? Now, for a completely different (but actually very similar) portrait of missionary life, please take 15 minutes to watch this great video. Fifty years later, Steve joins his father, Don, and two brothers, Shannon and Paul, to visit the Sawi village where they grew up. Journey with Steve as he travels to the swamps of Papua, Indonesia, to introduce you to the Sawi, and explore the impact of the gospel among a previously unreached people group. So where's the similarity between the Georges and the Richardsons? The Georges seem dogged by repeated problems, while the Richardsons are seeing incredible fruit from their ministry. First, Don Richardson and Tim George both brought young families from American comforts to live in an underdeveloped society. Don was just 27. How many "20 somethings" do you know who would want to do that, much less who would actually have the skills and character to last in an environment as hostile as what the Georges and Richardsons face(d)? We need to raise the bar of training goals for our youth (before they hit their 20s) if we are going to produce more Don Richardsons. If our goal is to produce youth who can make enough money to live comfortably, we are not going reach the United States with the gospel, much less the unevangelized regions of the world. Second, remember that 50 years ago, Don Richardson had never read Peace Child. He didn't know he would be famous one day as a "successful" missionary. He took his family clear around the world to the Sawi without knowing whether there would be any fruit whatsoever. Missionaries motivated by anything less than love for Jesus quickly either burn out and go home, or compromise to achieve "results". Jesus gets honor whenever we present the gospel, regardless of the response of the hearer; His honor is the greatest result we could ever want. Join me in praying that in another 50 years the Georges will be able to visit thriving churches which they helped start. But that either way, they and the thousands of other missionaries around the world will be faithful to honor Jesus regardless of the response they see. That they each may someday hear the words, "Well done, good and faithful slave. Enter into the joy of your Master!" Most of my recent book reviews have been just that, book reviews. This one (although I got it free from Moody Press in exchange for reviewing it), I am actually recommending that you buy. If you don't need it, you'll know someone who does. And no, Moody didn't make me say that! It's essential that we get the gospel right, because the gospel is what gets us to God. No surprise, then, that there are so many seductive 'artificial gospels' available today. Like artificial sweeteners, they have delightful taste, but no nutritional value. Trevin Wax warns about six of these in Counterfeit Gospels. 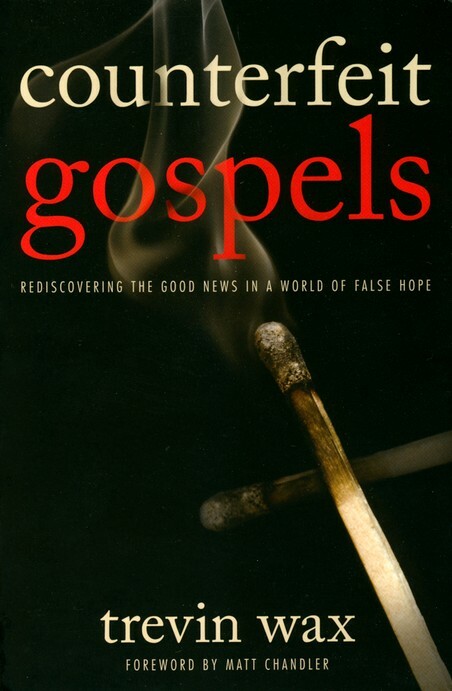 Each chapter about a fake gospel (chapters 2, 3, 5, 6, 8, 9) follows this pattern: an explanation of why this fake is a fatal deviation from the truth, how it has infiltrated evangelical thinking, why the imitation is so attractive, and how to guard our hearts against it. And, unlike some authors on this subject, Wax does not come across as a theological witchhunter, out to blast the heretics. His concern and tone is pastoral. If you've been reading people like John Piper, Don Carson, Tim Keller, Al Mohler, and Mark Dever, you probably won't find much "new" in this book. Yet, Wax does not come across as merely an echo. He blends personal anecdotes, clarifying analogies, and clear, accurate summations of theological truths in a way that is uniquely his. But one negative: I still have not figured out why the cover is a photo of spent matches. A friend posted the following true story to his Facebook page recently. Unfortunately as good as police are, they typically arrive at the scene after the crime has been committed and someone is seriously injured or dead. Protecting ourselves and loved ones is our responsibility. When we had a power outage a few years ago, our power was out due to severe storms for 6 days. Many of the homes in our development were vacant but a few of us stuck it out with generators and gas fireplaces. One night at 11pm with our neighborhood pitch black, a Honda Civic drove to the end of our cul-de-sac and four individuals not from our neighborhood got out of the car. There was no phone service either from land line or cell. I stepped out of my doorway with my Glock and flashlight and informed the individuals in a loud voice that I was armed and prepared to defend my home and family. They all piled back into the little Honda and sped away. I had not only saved my family from possible home invasion but my neighbors as well. The next day our phones came back up and I called the Sheriff and told him what had happened. He told me that there were numerous reports of robberies and break-ins those last few days and there were not enough law enforcement available to respond. He told me that how I handled the situation was completely appropriate and wished that more citizens were able to defend themselves in a reasonable and responsible manner. It is important to note that not a single shot was fired and no one not even the thugs were harmed in this encounter. There was no doubt their intention was to break into several homes in our cul-de-sac. I can only imagine what position we would have been in if these four individuals had burst into our home finding my wife and I defenseless. You would be surprised how many crimes are actually prevented by simply possessing a firearm without having to fire a single round. To be honest, I'm not sure I would have the guts do what my friend did. I admire what he did, and wish I was like him I get so nervous at even the hint of conflict that I think I would more a liability than an asset in a situation like this.